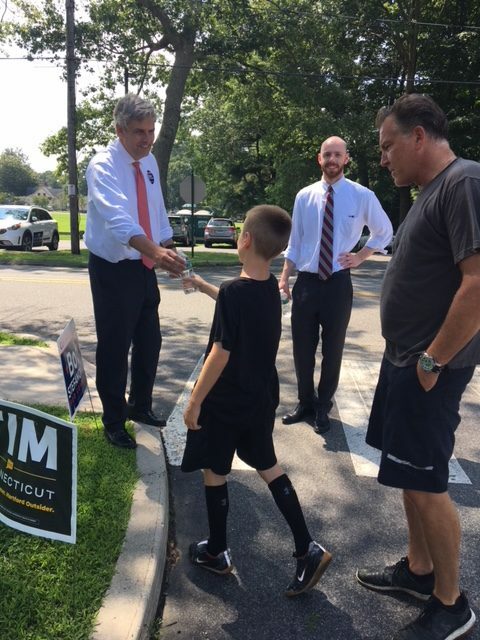 Bob Stefanowski hands a bottle of water to a young supporter outside the Madison polls Tuesday. Connecticut Democrats and Republicans go to the polls Tuesday to bring clarity to the unruliest of political seasons, making choices that not only will determine the major-party nominations for governor, but could forever change how candidates seek access to the primary ballots and encourage them to enlist friendly super PACs to supplement their campaigns. Three of the five Republican candidates for governor are backed by super PACs, emulating a trend in presidential politics — establishing dedicated independent-expenditure groups, which can accept unlimited contributions from rich supporters, corporations or unions as long as they do not directly coordinate with the candidate. The richest by far is the Protect Freedom PAC, the independent-expenditure group promoting Bob Stefanowski, whose campaign cannot directly accept contributions of more than $3,500. But his super PAC has raised more than $1.2 million, according to a report filed Monday, reporting $730,000 from a single donor: Reverge Anselmo, a movie producer from Greenwich and son of the late Rene Anselmo, creator of the world’s first privately owned global satellite network. Two of the five GOP candidates, Stefanowski and David Stemerman — both businessmen with no previous political involvement with the GOP — bypassed a state convention system that for decades has tightly controlled access to the primary ballots. If elected, either candidate would be the first Connecticut governor to win a major-party nomination by petitioning for a primary. A little more than 1.2 million of the state’s 2.1 million registered voters — the 769,414 Democrats and 451,869 Republicans enrolled as of midday Monday — are eligible to vote Tuesday in primaries for offices ranging from registrar of voters to open races for governor, lieutenant governor, treasurer, attorney general and Congress. Polls open at 6 a.m.
Thirty-five Republicans are competing in 15 races: five statewide constitutional offices, U.S. Senate, the 5th Congressional District, three seats in the state Senate, four in the state House and the registrar of voters in Ansonia. For the first time since the advent of public financing, the Democratic gubernatorial nominee is certain to be a candidate who did not participate in the voluntary Citizens’ Election Program: Ned Lamont of Greenwich, the wealthy party-endorsed candidate in a two-way primary with Bridgeport Mayor Joseph P. Ganim, opted to self-fund; Ganim’s criminal record bars him from public financing. But it is the unprecedented five-way Republican primary that holds the most potential for pointing future candidates to new ways of raising money and qualifying for primaries. As other states have migrated to direct primaries, Connecticut has remained reliant on state convention delegates to be arbiters of who can seek the support of the full party in a primary. The other three Republicans running for governor — Danbury Mayor Mark Boughton, former Trumbull First Selectman Timothy Herbst and tech entrepreneur Steve Obsitnik of Westport — all are participating in the Citizens’ Election Program and qualified for the primary by winning at least 15 percent of the convention vote. Boughton, who is running for the third time, is the party-endorsed candidate. Republicans have three-way primaries for lieutenant governor and the 5th Congressional nomination. Democrats have three-way primaries for attorney general and two state legislative races. Whatever happens on Tuesday, the results will be binding. Connecticut has no run-off provisions for races in which no one wins a majority. In the case of the five-way GOP primary for governor, the nominee could conceivably prevail with little more than 20 percent of what is expected to be a turnout of about 100,000 Republicans. A super PAC backing Stefanowski aims at Boughton. Obsitnik and Boughton are backed by more modest super PACs. The biggest contributor to CT Rising, which has raised about $100,000 in recent weeks to support Boughton, is linked to Boughton and his administration by Patrick Sullivan, a prominent Hartford lobbyist. Sullivan’s firm, Sullivan & LeShane, represents both the Boughton administration and Winters Brothers, a trash hauler with a facility in Danbury. Winters Brothers and an affiliate that owns the Danbury facility each gave $12,500 to CT Rising, one quarter of its total funding. Sullivan, who has been an informal adviser to the Boughton campaign, did not return calls for comment. Boughton’s campaign declined comment. Independent-expenditure groups played significant roles in the 2014 campaign, but only in the general election. Outside groups, mostly associated with the Republican Governors Association and Democratic Governors Association, spent about $18 million on that governor’s race. As of a week ago, Lamont had outspent Ganim $2.6 million to $606,000. On television, he outspent him by about $1 million to less than $200,000. Public financing provides participants with $1.35 million for a gubernatorial primary and another $6.5 million to the winner for the general election. But Stemerman, a hedge fund founder, already has spent $6.2 million on his primary campaign, with about $2.5 million on television and radio advertising. Stefanowski has spent about $2.9 million, with about half going to television and radio advertising. 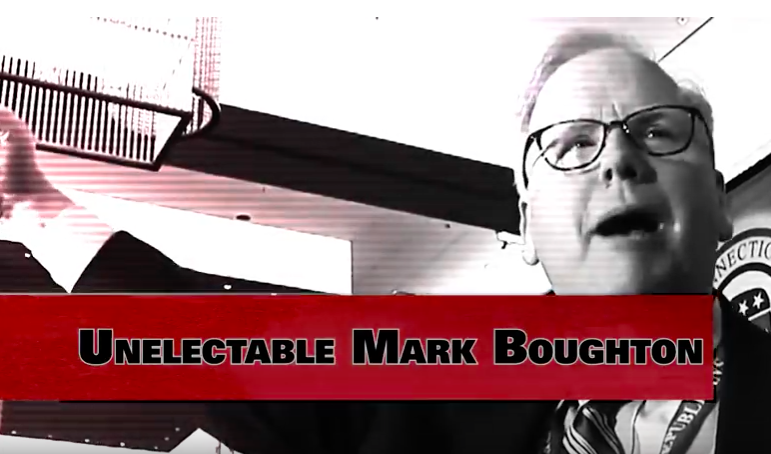 The super PAC supporting him has spent more than $600,000 on commercials, including an ad now running that attacks Boughton as a two-time, unelectable loser.